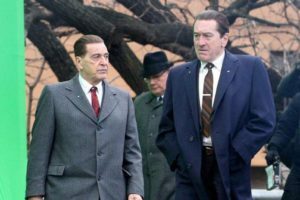 An upcoming Netflix movie on labor leader Jimmy Hoffa’s disappearance continues to generate buzz even though the film is not expected to come out at least for another year. One topic of conversation: When exactly will director Martin Scorsese’s movie “The Irishman” be released? I recently sent an inquiry to Netflix about the release date and received an email response on Aug 27, stating the movie is set to come out in the fall of 2019. That reflects what has been reported for some time. However, a recent Facebook post by investigative journalist and author Dan Moldea raised questions about whether the film might be delayed. In the Aug. 18 post, Moldea noted that Eric Shawn, a Fox News anchor and senior correspondent, told him the movie “has been postponed.” There was no indication how long it might be delayed. Shawn is preparing a two-hour documentary about Hoffa’s 1975 disappearance that was supposed to coincide with the release of the movie but now is expected to air anyway fairly soon, Moldea wrote in the post. “Despite the delay, Eric, relentless as always, plans to air his work — for which I have been interviewed at length — later this year,” Moldea wrote. The movie is centered on the 2004 book “I Heard You Paint Houses” by former prosecutor Charles Brandt. Robert De Niro has been cast as Delaware Teamsters official Frank “The Irishman” Sheeran, an organized-crime hit man who claimed to have killed his friend Hoffa on orders from Mafia bosses. Some in the underworld were unhappy that Hoffa, after serving time in prison, was attempting to regain control of the Teamsters and expose the union’s Mob connections. Hoffa’s disappearance has never been solved. Moldea contends the killer wasn’t Sheeran but instead was New Jersey Teamsters business agent Salvatore “Sally Bugs” Briguglio. In July, I explored the debate over the Scorsese movie in detail on The Mob Museum website. Click here.